0 AP & Sp. Atk Bonus Campaigns! ■ The 0 AP & Special Attack Bonus Campaigns are back! For a limited time, all quests and raid bosses will be playable for no AP cost! Use this opportunity to get caught up with the main story, progress through our ongoing event quests, or work on challenging Proud Mode quests! During this campaign period, you'll have better luck when unlocking or re-rolling your Special Attack Bonus! For example, when unlocking or re-rolling a Medal with a Tier 4 Special Attack Bonus, you would normally roll within the range of60% and 130%. But during this campaign, you will roll between 90% and 130%! You'll also experience the other following benefits, too! ・Earn double experience points from Medal fusion on the Level Up screen! ・The amount of Munny required for Medal fusion on the Level Up screen is halved! ★ The Halloween Banishing Campaign is here! Work together with your fellow Keyblade Wielders to defeat enemies and obtain rewards! During the period listed above, all players should work together to defeat as many enemies as possible and reap spooky Halloween-themed rewards as prizes! 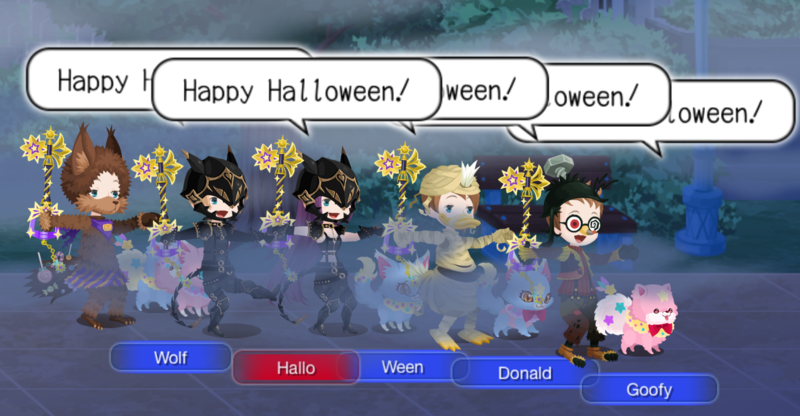 Special Union Cross Chat Phrase: Happy Halloween! * Defeating other players in PVP does not count towards the overall enemy defeat count. ・Rewards will be distributed from Oct. 26th. ・The current total of enemies defeated will be displayed on the HOME screen during the following times: Oct. 22, 2018 to Oct. 25, 2018 from 12:00 a.m. to 4:00 a.m. (PT) / Oct. 22, 2018 to Oct. 25, 2018 7:00 to 11:00 (UTC). ・The final tally of all enemies defeated during the specified period will be announced in a later notice. The Special Attack Limitation Challenge is here! Test yourself to receive Event Coins and various other rewards! ・Challenge yourself in a series of quests with various special attack restrictions! ・There are a total of 15 stages to complete! ・By completing the challenges for these quests, you can receive rewards such as EXP Medals, Munny Medals and Event Coins! Black Cat Tail Union Cross! ★ Get the Black Cat Tail just in time for Halloween! This time there are a total of 6 Cross Boards, 4 of which will be unlocked from the start (Magic Broom Set #2 and Magic Mirror Set #2 will unlock sequentially as follows below). Complete them to earn the new Black Cat Tail Avatar Parts and more! Black Cat Tail (Female) Chat Phrase: Meow!? Get 7★ Prime - Neku & Joshua within 5 draws! 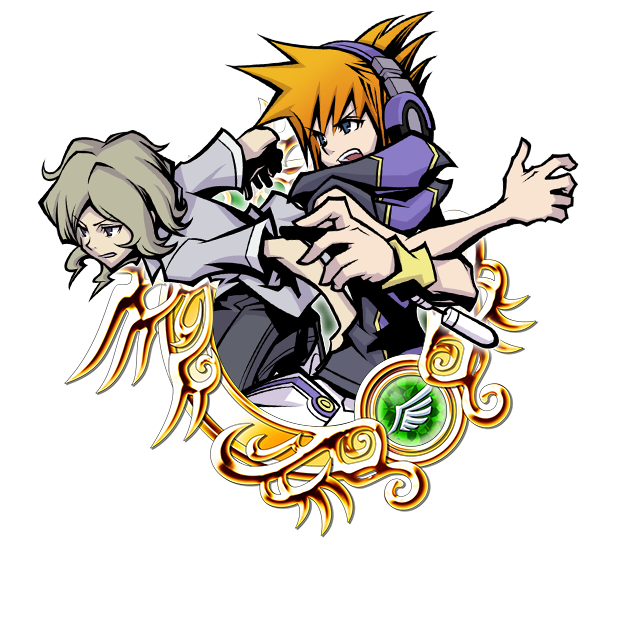 ★ The newest The World Ends with You Medal is here! Get Prime - Neku & Joshua within 5 draws with this 7★ Deal! Prime - Neku & Joshua is here! Get it within 5 draws from this special Medal Deal! Even better, as you're guaranteed to receive a 6★ Prime - Neku & Joshua Medal each time you draw from this Deal, you'll be able to take full advantage of the 7★ version's 5 trait slots!! NOTE: The 6★ version of Prime - Neku & Joshua will have 3 trait slots. As an added bonus, you will receive three Magic Mirror Medals each time you draw from this banner! ・The Medal will gain an increased SP Attack Bonus buff as a part of its Special Attack! NOTE: If the Medal's Special Attack already includes an SP Attack Bonus increase, this value will be further increased from its base value. ・A 7★ Prime - Neku & Joshua within 5 draws! ・One guaranteed Tier 6 or 7, 7★ Medal! ・A guaranteed 6★ Prime - Neku & Joshua per draw from this banner! ・Three Magic Mirror Medals each time you draw from this banner! ・Boosted Prime - Neku & Joshua: 1,000 more base Strength and Defense. The Return of the Moon Gem Cup! ★The Moon Gem Cup is back! Complete these difficult quests to get Event Coins and other great rewards! 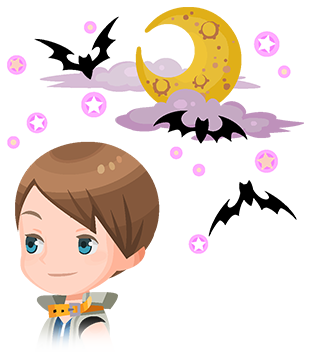 Players who manage to complete the quest objectives will receive two Moon Gems, a Fantasia Mickey B Medal, and Magic Mirror Medals! Even better, you can also obtain Event Coins! But be warned, if you fall in battle you will not be able to continue! *Moon Gems are required to strengthen the Darkgnaw, Missing Ache, and Diamond Dust Keyblades, obtained through Proud Mode, beyond level 26. Moon Gems are also required to strengthen various other Keyblades to level 40 and higher. Battle your way through to receive these great rewards!